Welcome to the Oberoi New Delhi! It is the worth-to-be-stayed place where you can spend your crucial days of vacation. The exotic location and the world-class infrastructure are enough to describe the beauty of this five-star luxurious lodge. It is one of the lavishing creations of Oberoi Hotels & Resorts. The Oberoi New Delhi boasts of many accommodation arrangements and magnificent amenities within its expensive ambiance. Staying at such beautiful place would be the experience of lifetime for any guest. The Oberoi New Delhi offers accommodation services through its deluxe rooms, luxury room, premier room, executive suite, deluxe suite, luxury suite, duplex suite, curzon suite and Kohinoor suite. It provides various facilities to these rooms like DVD Player, Plasma TV, Satellite television, Wi-Fi broadband internet access, electronic safe, two line telephone, mini bar, personalized butler service and non-smoking floor. Threesixty: It is an all day dining restaurant that serves some of the best food items from different parts of the world. Travertino: It is a wonderful restaurant that offers both traditional and authentic Italian cuisine. Taipan: Come to this beautiful restaurant and enjoy scrumptious Schezwan and Cantonese cuisine. Club Bar: Club bar offers its guests mouth-watering morning coffee, afternoon tea or after-hours drinks. The Oberoi Patisserie and Delicatessen: It is a nice place to taste pastas, patisserie, fresh baked bread, chocolates, cheeses and condiments. 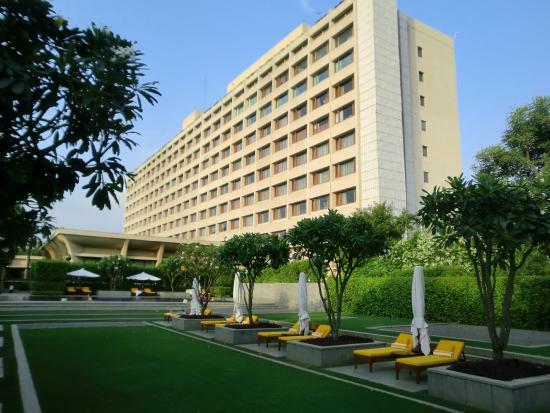 The Oberoi New Delhi is fully equipped with state-of-the-art amenities and services in the shape of fitness center, spa facility, beauty center, shopping, banquet rooms, business center and many more.